Cast your mind back to 2011. LloydsTSB acquired HBOS, instantly creating the biggest retail bank in the UK, with more than 25 million customers. This was the largest merger in European banking history. Training to unify the systems used by thousands of call centre staff across the banks, quickly, and without disruption to customers, was going to be a huge challenge. Each bank came with its own IT platforms which wouldn’t play well together, so the decision was made early on to integrate IT where possible into a single system. Lloyds Banking Group decided to go with the LloydsTSB desktop system as the Group’s primary IT platform for its call centres and set a date for the official switchover when it would go live for all staff. To meet the deadline, the Group’s learning and development team needed to train the thousands of recently acquired HBOS call centre staff. Day One was bought aboard to provide a training solution to prepare over 8,000 staff for the big launch. We were going to need a bigger boat. This was the biggest project Day One had ever been involved in, and with a fixed deadline, the pressure was really on to deliver. We started off by developing a software simulation training solution that would allow HBOS staff to get familiar with a practice system that looked and behaved exactly like the one they would be using. 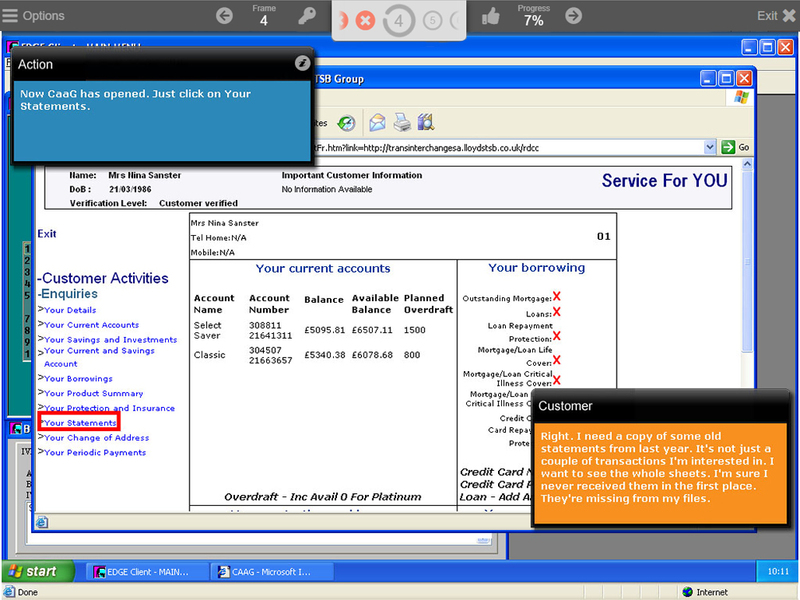 After their initial training session on the new system, the simulated software was added to their Halifax and Bank of Scotland desktops so trainees could practise key tasks on it, while still doing their day job on their old systems in the interim. Learning new system software is not like riding a bike, and if you haven’t been practising, you will fall off. To ensure ‘learning fade’ wasn’t an issue for staff, we set up an Exercise of the Day, which was emailed to staff daily to encourage them to do a little bit of practice every day. To meet the deadline, Lloyds had taken on extra staff (who also needed training on the new system) to cover the HBOS staff who were taken offline to learn the ropes of the new software. So in the run up to D-Day our simulation software was being used by up 600 delegates a day! Wowsers! 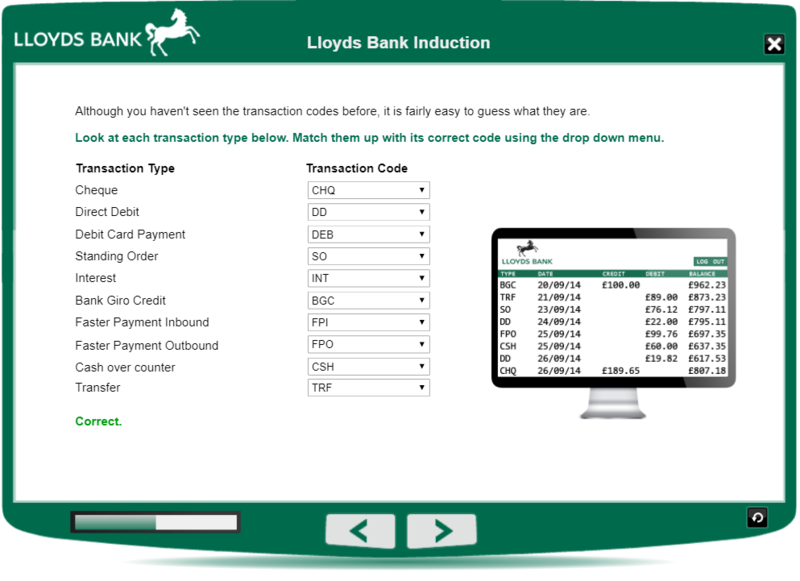 Our easy-to-access platform and highly realistic simulation software was integral to Lloyds’ retail banking training plan as part of a blended learning solution. By keeping the new software fresh in the minds of the advisors who would be using it ahead of the big switch, the HBOS call centre advisors felt supported and confident that they could make a seamless transition to the new system without their customers even noticing the difference. So it all went off without a hitch and they all lived happily ever after. See how we develop Call Centre Training for clients in any sector.